← How do we recycle wood? What can you do? Can you spot a fake email phishing attempt to access your secure information? Do you know how to avoid identity theft in everyday work? Do you know how to keep your personal information from being stolen via email? In this day and age, there is a constant risk of receiving email from someone trying to steal your personal information. These are called Phishing attacks and can come in many shapes and forms. 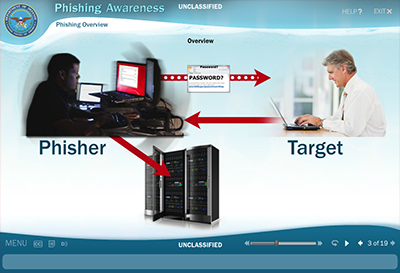 The United States Department of Defense put out a great presentation that helps you identify scams and phishing attacks before you become a victim. This entry was posted in Computers, General, Safety, Security and tagged computer, defense, email, identity theft, phishing, protect, safety, security. Bookmark the permalink.